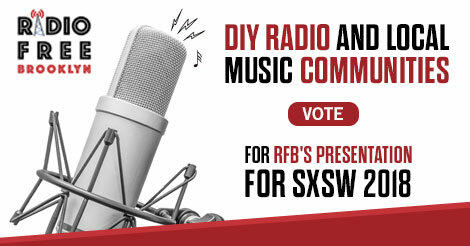 Help Send RFB to SXSW 2018! Hello and Happy August to all our listeners, friends and supporters! This month, RFB is thrilled to announce that we have submitted a proposal to present a panel at the South by Southwest (SXSW) festival in Austin in March of 2018. However, we’re not there yet and we need your help! Public voting on SXSW panels is open until August 25, 2017, and we would love it if all of our supporters would help by going to the Panel Picker page for our proposal and cast your vote. Public voting can amount to 30% of the final decision, so your vote really does matter! And we THANK YOU from the bottom of our collective radio hearts! Panel Description: With digital technologies evolving rapidly, opportunities emerge allowing average citizens to build their own DIY media outlets. However, with each advancement, we must be vigilant that attributes which made the old technologies unique are not lost in the process. In this talk, I will discuss methodologies used in leveraging the powers of both new and old media to create a DIY radio network that best serve the goals of creating community and shaping a freeform platform for artistic expression. How can local music communities utilize a freeform DIY radio to create a counterpoint to traditional performance platforms? How has time-shifting displaced “liveness” in broadcasting, and why does this matter? How can learning to build DIY networks facilitats the ability to analyze and understand a complex media landscape?